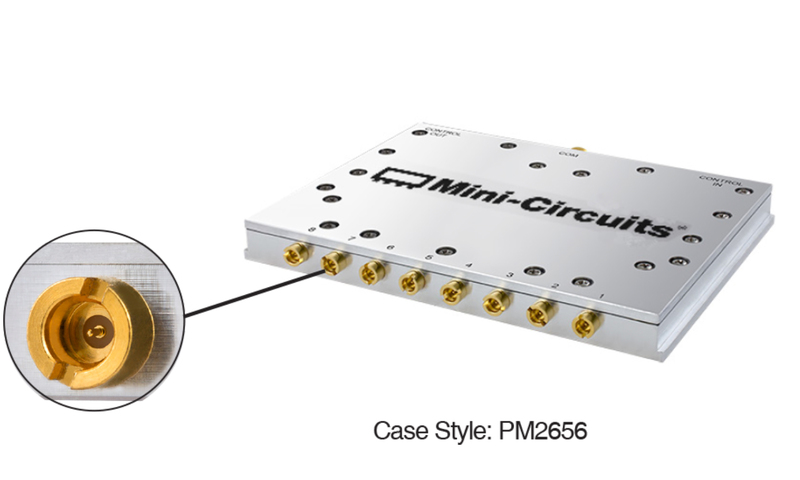 The Mini-Circuits’ SPI-SP8T-6G is a low cost, high speed solid state RF SP8T absorptive switch, with control and power via a Hirose DF11 connector. The model contains an electronic, high speed (6 µs typ switching time), high linearity (IP3 50 dBm typ), SP8T switch. The RF switch is operated using a three-wire SPI interface compatible with TTL and LVTTL voltages, and allows connecting up to 50 units in series to the same control line in a ‘daisy chain’ configuration. This makes the switch ideal for research and development, automated test equipment, and controlling RF signal paths. This RF switch operates over a wide frequency band from 1 to 6000 MHz with high isolation of 80 dB typical, making the switch perfectly suitable for a wide variety of RF applications. The SPI-SP8T-6G is constructed in a compact, rugged metal case (3,68” x 3,27” x 0,40”) with 9 SMP(M) connectors (COM, and J1 to J8), and two Hirose DF11 connectors providing SPI control and power, one for input and one for output when connecting multiple units in series.